The global hybrid additive manufacturing machines market is prophesied in a report by Transparency Market Research (TMR) to find players putting high emphasis on development of new products to boost their brand positioning. This could be evident with the launch of LUMEX Avance-25 by Matsuura Machinery Corporation in 2016. Introduction of new products could also help players to outshine their competitors in the market. Stratasys Ltd., Mazak Corporation, and DMG MORI Co., Ltd. are some of the leading players operating in the industry. With a view to improve their market shares, players are expected to enter into tactical mergers and acquisitions and establish strong partnerships. TMR prognosticates the global hybrid additive manufacturing machines market to register a 21.69% CAGR between 2018 and 2026 to be worth a US$6.75 bn by the final forecast year. In 2017, the market achieved a valuation of US$1.16 bn. By vertical, aerospace could take a leading position in the market while rising at a 23.67% CAGR. On the basis of geography, the market is predicted to witness the rise of North America as a prominent region. By the end of 2018, the region could rake in a US$0.4 bn. Growth of the world hybrid additive manufacturing machines market is foreseen to gain momentum with increasing awareness about several advantages of the machines in different industry verticals. In the manufacture of functional products, advantages of both computer numerical control (CNC) milling and laser cladding are brought to the table by hybrid additive manufacturing machines. Use of hybrid additive manufacturing machines also helps with reduced time to market (TTM), minimized lead time, and material savings. Although application of hybrid additive manufacturing machines in production is not yet mainstream, it could grow at a faster pace in the coming years. Hybrid additive manufacturing machines beat traditional manufacturing methods in producing fully functional components that are complex in design. 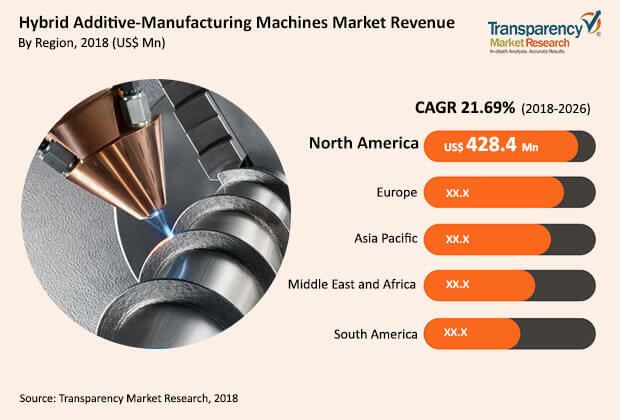 The international hybrid additive manufacturing machines market is projected to enjoy the advantage of a number of positive factors to increase demand in the foreseeable future. However, extortionate cost of hybrid additive manufacturing machines could pull back some of the demand in the market. Nonetheless, high use of hybrid additive manufacturing machines in the production of various types of components is envisaged to lower their prices in the near future. Besides automotive, hybrid additive manufacturing machines find application in the aerospace industry for producing robust natured and lightweight components. Moreover, they could be used in the manufacture of medical components and tools. In addition, prosthetic limbs for amputees, dental fixtures, and orthopedic implants are manufactured with the use of hybrid additive manufacturing machines. Thus, it could be said that market will offer rewarding prospects until the end of the forecast period.